The turbine was run up several times on windy days to check out the performance. I live in a residential area with quite a few trees surrounding the garden and the first thing that became apparent was how gusty and unsteady the wind was. The turbine would produce bursts of power in the gusts but these would be constantly changing directions. This confirms the need for an unobstructed site for a permanent installation. 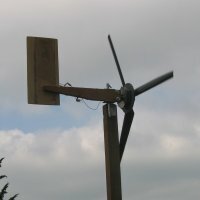 I also had no means of measuring the wind strength so it is not possible to get any overall efficiency figures. In the gusts the turbine ran up well and the various bulbs used for load would glow brightly. The rotor seemed to start easily and accelerate in the gusts but it didn't seem to be picking up enough speed suggesting that the blade pitch was too coarse. A couple of videos of the turbine in action. Disaster struck when I shorted the alternator so I could take the turbine down with the blades stalled. Initially, the blades started to slow and then the power disappeared and the rotor speeded up again. When I got the turbine down the stator had been dragged round the axle ripping the wiring out of the stator body. The stator was a write off.